Caesars Entertainment Corporation’s plans to skirt conglomerate-wide bankruptcy by placing a large portion of its imposing debt into a major operating subsidiary now appear headed for trouble after the judge charged with overseeing that subsidiary’s Chapter 11 reorganization plan threatened Caesars [CEC] over the company’s hopes of blocking roughly seven million pages of relevant documents regarding Caesars’ years-long reorganization. Last week, Judge A. Benjamin Goldgar of the U.S. Bankruptcy Court in Chicago admonished Caesars and its attorneys over its attempt to seal the hefty Davis Report and the mountain of accompanying information. Caesars had previously agreed to allow bankruptcy examiner Richard J. Davis to compile an independent investigatory report on whether Caesars’ corporate reorganization amounted to a fraud launched against Caesars’ second-lien creditors, essentially leaving them holding several billion dollars of debt left within the newly-created Caesars Entertainment Operating Company [CEOC] unit. 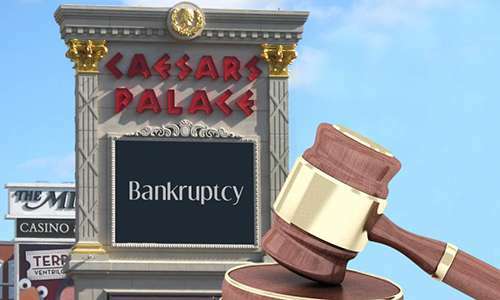 The CEOC unit currently holds most of Caesars’ bad debt, and it is unlikely that the junior creditors now holding CEOC notes would receive more than a few percent return on their investment, should the CEOC bankruptcy and reorganization be allowed to proceed according to CEC’s plans. Except that many of those junior creditors filed suit against CEC and CEOC last year, alleging that the entire reorganization being attempted by Caesars was fraudulent. Both sides agreed to allow the examiner, Davis, to construct his independent findings, but several news outlets have now reported that since Davis’s findings are likely to be unfavorable to Caesars, they are now seeking to bury the report by slapping a “privileged” tag on the information. That drew Judge Goldgar’s ire in last week’s hearing. And it’s what those outcomes could include that holds the real heat here for Caesars. “It doesn’t have to end with a confirmed plan,” the judge continued. “A trustee could be appointed, the case could be dismissed or, my favorite, the case could be converted to Chapter 7, which would just be a hoot, wouldn’t it?” Chapter 7 bankruptcy involves liquidation, and that would likely apply to all of Caesars, not just the CEOC debt contrivance, as it’s increasingly being seen. There’s even more than that at stake. A recent update by the admittedly sensational New York Post claims that Davis’s report will allege that some civil fraud may have occurred, which could result in additional legal trouble for Caesars and its board of directors. The Post story asserts that Caesars’ board members could be held personally liable as well, naming TPG Capital founder David Bonderman, Apollo Global Management founder Marc Rowan, and board member and former Pittsburgh Steelers star Lynn Swann among those facing a possible hefty financial reckoning. In the meantime, the examiner [Davis] has been ordered to continue preparing his summary of his findings, but with certain information redacted pending the outcome of the latest legal dispute. That report is expected to be ready sometime in mid-February. Should the CEOC reorganization plan end up being blown up by the court — an outcome that now seems increasingly likely — than all of Caesars’ gambling properties and brands face an uncertain ownership future. Imagine watching Caesars’ popular and profitable World Series of Poker (WSOP) brand being put on the auction block or being forcibly sold with regulators’ approval. The WSOP itself isn’t going away, yet there’s no guarantee that it will remain in Caesars’ hands in future years.